I was surprised to discover that several of my 7th and 8th grade students were at first hesitant to read a graphic novel. It was new and different. My higher level readers were bothered that the novel had pictures and they felt it would be "too easy." So I decided to start them with an author who is anything but easy: Edgar Allan Poe. I purchased a set of Graphic Classics: Edgar Allan Poe (4th Ed). We did a book-walk, examining the cover and a few pages of the graphic novel, discussing what we noticed. The students were immediately intrigued by the intensity of the drawings and frequently stopped a neighbor to show them a page from the book. Then we did a class reading. While it's highly unusual to read a graphic novel out loud, I wanted to walk them through how to follow the panels and discuss the meaning behind the drawings so we powered through the awkwardness of saying onomatopoeias out loud and enjoyed the narrative portions. 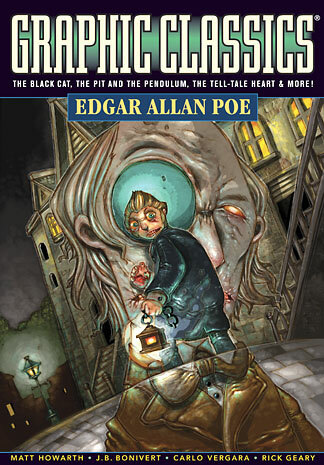 The first story we read was called "The Black Cat" and was every bit as dark and distrubing as is to be expected with such as Poe. The kids LOVED it. They were actively engaged with their exclamations of surprise and horror. It was such a joy to read the story with them. When we finished, they wanted to read more. For those of you who have taught middle school English before, you know that this is a rare occassion. Students begging to read more?! The bell rang and they were reluctant to go, hoping that we could somehow squeeze in another story. I finally shooed them out the door and prepared for my next class. Now, I'm not going to get into the details of my research on the benefits vs. drawbacks of graphic novels in education (as that is for a whole other post or set of posts coming soon to a blog near you). However, I will go on to say that I split the students into two groups: one group read the original text without the aid of pictures; the other group read the graphic novel version of the text. Before assigning the texts, I did a side-by-side comparison of the two short stories I wanted them to read to make sure that all the important information was available in both texts. We started with "The Cask of Amontillado" before moving into "William Wilson." Both texts are difficult and require the students to think outside the box. If you haven't read them, I recommend it. They were so wonderfully written by Poe, and the graphic novel version did an exceptional job of illustrating to accompany the text. My graphic novel group excelled in their reading. The pictures guided them through difficult parts of the text and they felt confident in their reading. In fact, some members of the graphic novel group even wanted to read the original text to compare it with the graphic novel version they had read. Wha-wha-what? You want to read the text heavy version to compare-and-contrast! My dreams were coming true before my very eyes! If you are not yet using graphic novels in your classroom or at least encouraging your students to read them, I cannot stress strongly enough the amazing transformation I witnessed from my struggling readers who couldn't put them down to my strong readers who enjoyed challenging themselves with more difficult texts in graphic novel format.